This is just a quick post to give you loyal readers something to look at while I'm away! The 'nearly complete' Lascannon teams I showed you in the last post are now done! 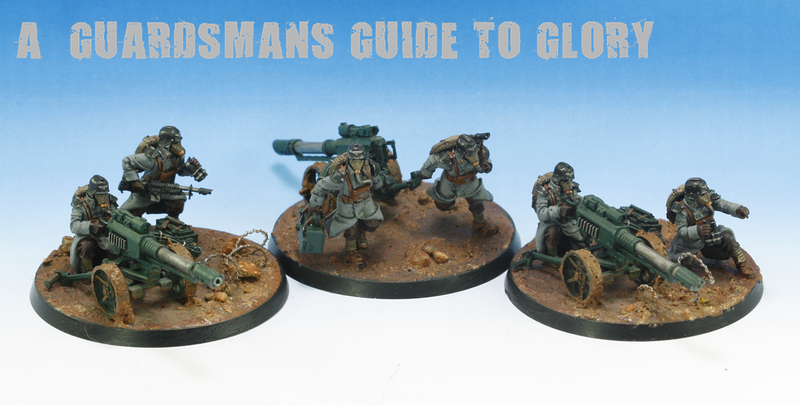 This is one of two squads attached to my infantry platoons for my Krieg Siege Regiment. I've got this week off work now, which will be spent working on the next awesome terrain project: Mag-Lev System! Very nice. The mud covering the wheels of the lascannon mounts is a great touch. Great job on the miniatures, I echo Ron's comment on the mud on the wheels, really great addition. Absolutely gorgeous! Looking forward to seeing how the mag-lev system comes along! Thanks guys! Theres nothing like a bit of mud to jazz up your Krieggy Boys! More on the Mag-Lev on Wednesday Mordian! A Guardsmans Guide to Glory's Birthday!